The colour, the atmosphere and the beauty that is bollywood is presented for your pleasure and enjoyment by the the vibrant and glamorous Bollywood Belles. If you want exhilarating and energetic entertainment then look no further. 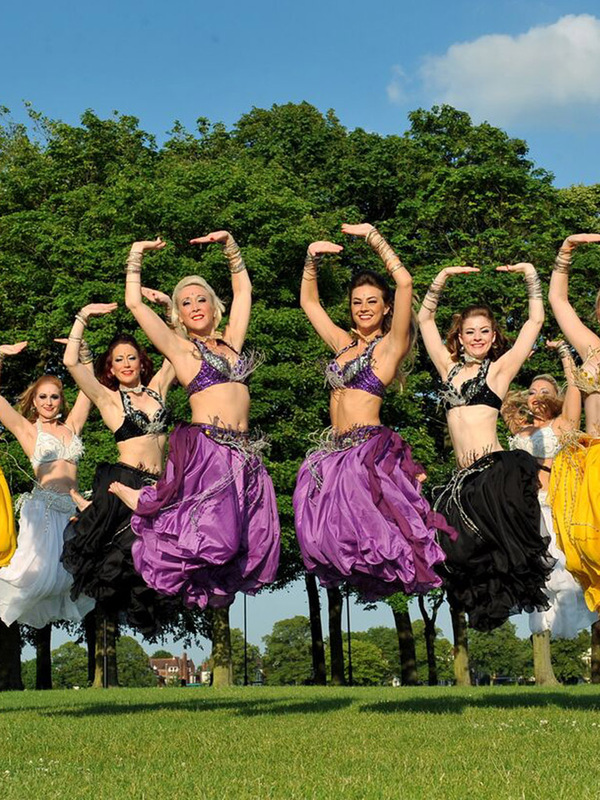 Bollywood Belles offers you the ultimate in authentic Asian dance entertainment. 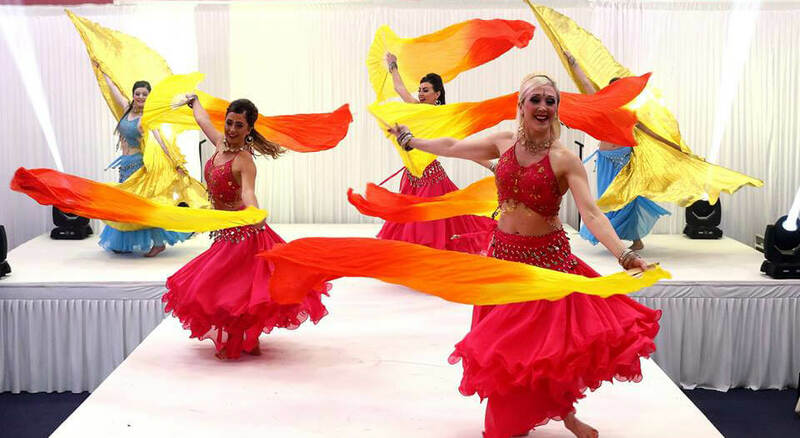 From Bollywood to Bhangra we can produce it all, captivating audiences worldwide we will leave your guests wanting more! These girls are friendly and welcoming. Have worked alongside them in many shows and they're shows are amazing. Great costumes and music choice, and the dancing is unbelievable, not to be missed! Absolutely amazing performances! They were fantastic and tailored to what we wanted. Well done girls. A Professional company who set the atmosphere and ambience for any event with outstanding dance performances! Many thanks for providing your dancers for the WECA Mela yesterday. They performed exceptionally well despite the awful weather. From the feedback received, they were one of the best performers on the day. ‘You guys were amazing !!! !...people kept coming and asking who you were. Definitely made the right choice in having you guys you made the evening. THANK YOU SO MUCH FOR BEING PART OF OUR WEDDING DAY! It was vital for me to have that fusion element in my wedding and you girls were it! The whole Patel family were talking about the high standard of dancing the next day and they said you all excelled at it. They were particularly impressed with how precise your facial expressions were! I have so much to learn about the Indian culture and the dancing but what a way to start having you lovely ladies at my wedding. The Patel family also commented that you out performed the traditional dancers that they know. Well done for pulling off a 120% performance, I cannot wait now to see our wedding DVD. Both Parag and I REALLY enjoyed watching you. Good luck with all you do in the future. Here's to seeing you again soon! 'Thank you very much for your great performances. All the guests enjoyed it thoroughly. Thank you for preparing that video for me. Well done to all the ladies. Loved the Bollywood performances full of entertainment and got the atmosphere buzzing! Was lovely to watch u ladies dance at Lemore Manor ! The dance workshops were fantastic; I know the people that joined in had a fab time. We haven't had dance performances at any of our events for many years, and for the group to agree to have you back again next year, before the night was even over, says something !! The group was fantastic and were extremely professional at all times and we look forward to seeing you again next year. Absolutely fantastic dancers, great choice of songs, very professional and enticed all the guests. Would recommend highly, cannot wait for our next event to book you again!!! Thank you. A class act! A professional dance group that are exceptional, well choreographed to the music and song. You will be left spellbound. That's why we booked and booked again. Our guests loved them and wanted more!! Not award winning for nothing!